This Child With Autism Loves SPAM. What SPAM Did Next Will Melt Your Heart. Jackson Sizemore counts SPAM as his favorite food. The company returned the love, throwing Jackson a SPAM party and making him an official SPAMBASSADOR. Like most 4th graders, nine-year old Jackson Sizemore from Louisville, Kentucky has a favorite food. Unlike most of his classmates, it isn’t pizza or ice cream or hot dogs. Jackson loves SPAM, and what’s even better is that SPAM loves him back. Tiffany admits she didn’t expect a response, but the team at Hormel quickly sent out a SPAM-themed gift basket. A couple of weeks later SPAM brand manager Brian Lillis was driving through town on vacation with his family and arranged with Tiffany to stop by for a visit. He brought a full-fledged SPAM party complete with cases of SPAM, T-shirts, sunglasses, a custom-made cape for Jackson, and a chef’s hat. Jackson fried up SPAM for his guests, and was thrilled to meet SPAMMY, the meat product’s mascot. But, the story doesn’t end there. Just a few weeks ago Hormel flew Jackson, his parents, older brother, and grandparents up to Hormel headquarters in Austin, Minnesota for a week of SPAM-related activities. The highlight was an afternoon at the SPAM museum where the staff trained Jackson to become an official SPAMBASSADOR. He answered guest questions and handed out SPAMples. 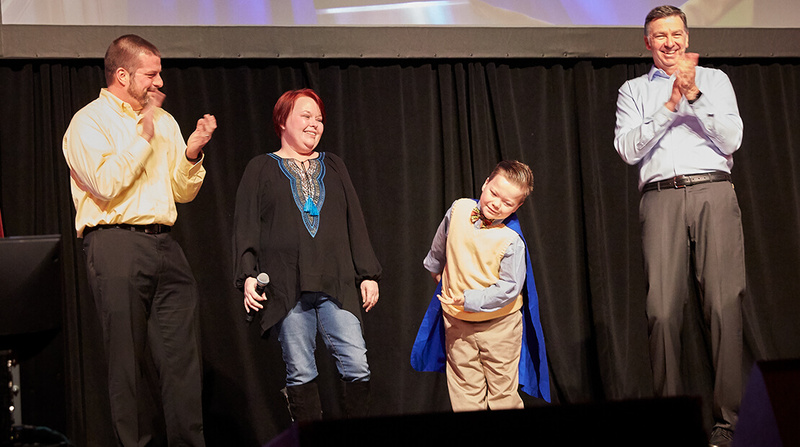 Jackson even went on stage and took a bow at the company’s annual shareholder meeting. He was named Hormel’s first-ever Inspired Fan.